Walter Foster 159, Heads in Oil Pastel by Stella Mackie with some demonstrations by Walter Foster included falls into the traditional format of all the Walter Foster art instruction books. It's oversize, about 10 1/4" by 13 3/4" and thin with saddle stitching and full color illustrations printed on good heavy non-yellowing archival paper. Artists either love or loathe the Walter Foster format. I enjoy it a lot. As with all of these, text is minimal and the strength of these demonstrations rest on the progress images of each project included. Portraitist Stella Mackie shows every stage from construction sketches done with marker or brush on up to finished portraits of children, young women, young men, old men with various complexions including black and Asian portraits. Her style is loose and painterly. Most of the portraits are vignetted without complex backgrounds, looser as they fade to the color of the surface receding from the face. This really is just about the heads, and conveys a lot of information in relatively few pages on facial proportion and structures as well as placement and composition information. One portrait of a young girl includes hands as she's playing a violin, this and the geisha-looking girl with a cherry tree screen in the background have the most props or details other than the head. Much more is shown than told in Walter Foster 159, like all of the series. 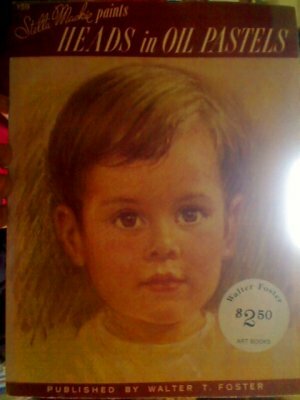 Stella Mackie uses alcohol or thinner washes at early stages of many of these portraits but didn't always mention that in the text, so I would advise beginners to get other books along with this one such as the McLaughlin volume on oil pastels also in the Walter Foster series. What's great in Walter Foster 159 is the painterly style Stella Mackie demonstrates and her suggestions for color mixing to get good skin tones -- she does handle various complexions including light complexions well and shows how reflected light from clothing can alter the shadow colors on a portrait. Look close at all the images more than once -- it is a gem for good progress shots and Walter Foster's unselfconscious style. His self portrait had a few flaws and his page cheerfully admits that, a moment of humor in a pleasant read and a good study. 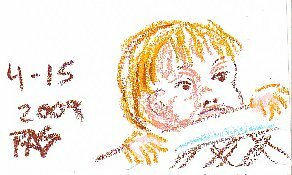 Below is a portrait of my grandson done in Pentel oil pastels on a wirebound ProArt sketchbook page.